I can't believe it! Today is the last day of The Two Writing Teachers March SOLC of posting daily for the month of March! Another March SOLC completed! Yea! That was fun! I can hardly wait for next year! This is post 495 for me on Mainely Write. I am on my way to 500. This Saturday will be my 500th blog post! 500 posts. Huh. Who knew that would happen? On that day, I'll be on letter E in the A to Z Challenge. Excellent! When I started this back in December of 2010, it was a whimmish thing. I didn't really get serious until March of 2012, when a teacher friend of mine, Wanda, mentioned the Two Writing Teachers Slice of Life Challenge. I decided to give it a try for the month of March, and from there I continued to blog on most Tuesdays. Through that I discovered Poetry Friday, and added that to my "must do" list. Then Laura Salas Purdie had her 15 Words or Less prompt, that I'm not sure how I ran across. There were then Flash Fiction challenges, A to Z Challenges in April, and Poetry Jam.. before I knew it, I was deep into blogging. I've met so many great people and read so many great stories and poems - I barely get any books read. Through the encouragement of fellow bloggers I have had one poem published in an e-zine, I've expanded one of my poems and am having it illustrated for Indy publication, and I have begun writing a children's book, "Island Cat". I've also begun a new blog "I, Noah Cat", starring my new cat, Noah. Thank you Two Writing Teachers, for giving me the encouragement, the outlet, the audience to build and grow. Now, tomorrow, bright and early, we begin the A to Z Challenge for the whole month of April. A post a day will be happening here (except on Sundays) and in many other places in the Blogosphere. Check here to find some links to some other participants' blogs: Blogging from A to Z Challenge, April 2014. This will be my third year participating, and I think I'm set to go! I will have a few posts ready to go up automatically for the end of April, as the last week in April is when our second grandchild arrives and I doubt that I will be able to focus on X, Y and Z! So what that means is, I am finding books, by Maine authors with titles A to Z. I will have a picture of the book, tell you a bit about the book, add a link to the book, and feature a poem I've written by the same name as the book (but not necessarily having anything to do with the book). Oh, and don't forget to check out the 2014 Kidlitosphere Progressive Poem that is being written starting TOMORROW. The first line will be by Charles Waters. I'm up for adding a line on April 3! Check the sidebar for dates and poets. And in May, after grandbaby 2 arrives, I will probably be posting grandbaby and grandson stuff again, at least for parts of the month. Day 30 or 31 of SOLC! We are almost at the end of March. Seems hard to believe. We still have plenty of snow here in Maine. It is supposed to rain today, so that may be the end of it...hopefully. But it always snows sometime in April - often when the daffodils are up. I've seen snow in June, too; but that is less likely to happen. But what was I talking about? Oh, yes. My grandson. Who cares about spring? It was his job to feed the dog. He would pick up the dog's bowl, bring it to the closet where the food was stored to set it on the floor. Then he'd unzip the bag of dogfood and scoop out food. This was a bit tricky, as he couldn't get a full scoop, so I had to watch and see what fraction of a scoop it looked like, so I could tell how many were needed. It was usually 3, sometimes 4. After he'd put about the right amount in the dog's bowl, he'd zip the bag, close the door and bring the bowl over to the dog's eating area again. Then would come the difficult part. Getting the dog, who is on pins and needles waiting for the command to eat, to eat. He would go across the room and say, "Food!" That would be great if that were the command to get the dog to eat. But the command was "Eat!" So I'd whisper to him ( so the dog wouldn't take it as a command), say "Eat". "Eat the food!" he'd whisper. "Say it louder," I'd encourage. " Say "Eat!"" I said, just a bit louder. Now the dog thinks I just gave the command, and I had to pull her back. "Eat the food!" he says just a bit louder. I released the dog to the food. It was too much for her. By the last day, he got the idea. "Eat the food!" he yelled. I'm so happy for the dog. Can you believe it? 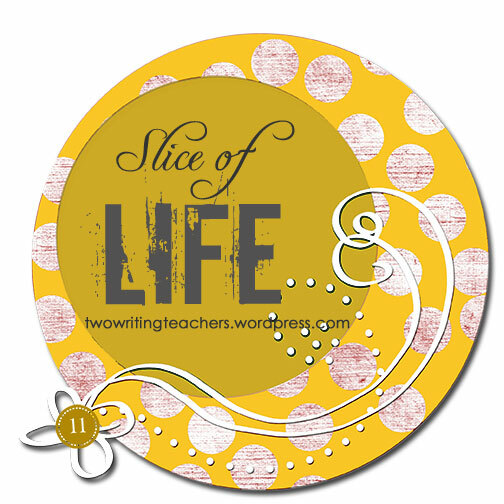 It's Day 28 of 31 at Two Writing Teachers Slice of Life Challenge! Today I'm commenting. Sometime, somehow. I have commented but not as much as I'd like to. Seems it's been so busy lately. When I was babysitting, I found myself singing. I was singing a lot. And I remembered singing a lot when my own kids were small. Every night I would sing "I love you a bushel and a peck..." and "Edelweiss" after storytime, as they lay in bed. I sang "Edelweiss" for my grandson also, substituting his name for "homeland" at the end. I also sang "Jesus Loves Me" and "Everybody Ought to Know" and other hymns throughout the day. And then there were the random songs. By random songs I mean, songs I made up on the spur of the moment - songs that don't necessarily end up rhyming, and aren't to any tune anyone would recognize - songs made up to go with whatever we were doing, or what I was thinking at the time. They could be songs about taking a bath, brushing teeth, putting on a shirt, walking, hopping...you name it, I'll sing it! I couldn't sing one to you now if I wanted to. I tried. I tried singing one like it for my husband, but I couldn't. I think it has to do with singing to a 2 year old. He liked everything I sang. He thought it was wonderful and swung those little hips and elbows, or marched, or changed his shirt! and he's gonna show me how!" "and then he's gonna put on his pants (or socks, or smile)!" See, no rhyme. But he still liked it. And he put on his shirt and pants. You have to make up your own tune for this song. I have one in my head, and I'd love to sing it for you, but it's just not going to happen. Remember, it is not like "sung to the tune of"...anything anyone ever heard before. It's a random group of notes, though I try to make it songlike and repetitive. If you don't sing, do it. There is nothing like singing to your toddler. They love it. If you don't have a toddler, sing to your older children. They will think you are crazy (unless you sang when they were toddlers). Or sing when you are alone. Sing out. Sing loud. Sing anything. It feels good. And you don't have to rhyme or know a song. and last I'll read my book! But don't sing WHEN he's reading. Do you ever just sing out? Why? When? Today is day 28 of 31 in March. If you are looking only for my poem for Poetry Friday and Poetry Jam, it is at the bottom of the page. But I think you should read all of the post. Just my opinion. You can head to the bottom only if you want though. I'll never know. I think I will finish up March SOLC with more mini-moments with my grandson. There were so many days where there were more things that I wanted to tell, but just couldn't fit them in. So, how about the Brown Bear incident(s)? Of course, no grandparent worth their salt (and especially if that grandparent happens to be a retired teacher) would go a day without reading a story to their young grandchild. And we read a few books each day, and one at night-night time. Sometimes I chose the book, and other times he chose it. This particular evening I chose this book. It is one I've read in my first grade in the beginning of the year and then we've done rewrites of the story. This book is Brown Bear, Brown Bear by Bill Martin. Many of you, teachers and parents, are nodding your heads. Ah, yes, what a wonderful bedtime story for a toddler. Grandson and I snuggled on the beanbag chair in his room after brushing teeth and putting on cozy pajamas. I began reading the book. To see if he'd read it before, and knew some of the words, I read it slowly Brown Bear... Brown Bear... what do you see? I see a...red...and I paused to see if he knew what would be on the next page. He didn't seem to, so I quickly turned the page and said "bird!...Looking at me! Red bird...red bird...what do you see? (pause) I see a yellow... (turn the page fast) duck (excitedly) looking at me! I read the whole book that way and he loved it and wanted me to read it again. This night I did. Now, the next night, I asked what he would like to have me read, and it was "Bear Book". "Oh, you mean Brown Bear, Brown Bear?" I asked. "Brown Bear!" he grinned and jumped up and down. I began to read it as I had the night before, pausing and turning pages quickly to reveal the animal that was next. But this time after the first page, he got up from our snuggle on the beanbag and walked away from me. He walked to the middle of his room and stood there looking at me. I was going to call him back to listen to the story, but decided to go ahead and read one more page and see if he did all by himself. Maybe he really wasn't interested in this book after all. Oh, no! That wasn't it at all! As I got to "I see a red..." and I turned the page, he screamed "bird!" and jumped up and down. "I see a yellow..." and I turned the page. "Duck! Quack, quack!" And he jumped up and down excitedly again. ..."Teacher, teacher, what do you see?... I see..."
And on the very last page he, a bit more calmly, named everything that the children saw. Guess what we did the next night. Yes. Same book request. The same performance. Except now I didn't need to turn the page before he squealed out the name of the next animal. When I turned the page, he was delighted to find that he was correct, and jumped up and down (and sometimes twirling was involved) in celebration. I got to pick a different book some nights, but those nights he slept with Brown Bear, Brown Bear and his wind-up flashlight. I told him he could read it in bed after lights out. And that flashlight was on before I could get the light shut off. When his parents returned I got his Brown Bear book. I decided I'd better let his mom know what I'd inadvertently created. I told her I was sorry that I'd turned it into an active book, but that actually it was a continuation of the reading process. He was remembering what was on the pages, acting it out and getting excited about the book. I couldn't turn it back into a cozy, sleepy story now! As I began to read it to him, he immediately made his way off the couch, around the coffee table and into the middle of the living room so he would have enough room for his "reading". And he didn't disappoint me! He did the whole thing, calling out animals before I turned the page, making animal noises and jumping up and down. "Nannie, he's asking for a brown bubbles or something, I can't understand him." "Oh, Brown Bear! Just a minute, it's down here!" I scrambled to get him the book. Ahhh. All was again right with the world. "Brown Bear, Brown Bear, what do you see? I see a little boy, looking at me!" For your enjoyment - Grandson hasn't seen these, but I'm sending the links to my daughter! Now this is kind of what HE was doing, though he hasn't seen this video yet! Hold him in your heart then, love does not let go. That ball is really moving! He picked up two balls - one smooth green soft plastic, about the size of a tennis ball, the other also green but spiky and a little larger - both were flashing bright, blinking lights. He began pumping his arms, wiggling his hands and then twirling the balls out in front of him up and down round and round furiously. He suddenly stopped his gyrations and both balls became quiet and unlit. He thrust both darkened, lifeless balls, towards me. It was then I realized he had been juggling! I took the balls dutifully and began juggling as he had - which, by the way, is a much safer way to "jungle" than letting them go flying through the air! When I "jungled" though, only one ball lit up. It was motion sensitive. The other stayed unlit. I shook it more, thinking it would light up. Nope. Squeeze? No, not that. So I said, "I don't know how to do this. How do you make this one light up?" Without a word he simply reached out and gave the ball a good whack with his hand. Immediately it began twinkling with life and light! He didn't have the words to explain it yet, but he knew what I had asked. He grinned at my surprised look. And THEN, oh, yes, then I REALLY put on a "jungling" act! Day 26. We're on the last stretch for March SOLC. I wonder how many will make it to 31 days with a daily Slice of Life? Then, on Tuesday, April 1 (yipes), I will be participating in the A to Z Challenge for the month of April. And because it is Poetry month and that is what I have done for the past 2 years, that is what I will be doing again - a poem a day. My theme, you ask? Well, I have an idea. I'm just not sure how well it is going to fall into place. My husband has said that I should do this theme next year and actually over the summer take pictures to go with it, as I did for last year's theme of Maine lobster boat names from A to Z. I was able to take pictures of almost all of them, and some were sent to me by boat owners or available online. I enjoyed writing poems for all the boats and searching out pictures for them. But I am too antsy to do this one regardless of not having pictures, I may still have to do it and just adapt it a bit for no images. Maybe I can send out an email for images... oh, I have another idea. Okay, you will just have to check back on April 1 to see what I finally decided to do. Last night my grandson and I sat on the couch watching tv a bit before beds. He was snuggled up beside Mel. I was savoring the moment, knowing I'd be leaving in the morning without seeing him. He never even heard the door open as his parents arrived home. My daughter peeked around the doorway and he glanced over there. I am on a train home after being in Pennsylvania for 2 weeks with my 2½ year old grandson. At 2½, two weeks is forever. It's a good percentage of your life so far. I figured it out (I figured out where to get the answers anyway!) it's 1.48% of his life, and only .06% of mine. Do you see why time seems to go so quickly as we get older? Each minute is just a smidgen of time for me relative to my age. For a kid waiting for a birthday, each minute is a good portion of their life thus far. Anyway, though I haven't been able to be a big part of his life, these 2 weeks have been a wonderful opportunity. I treasured all the moments and have a lot to tide me over until April, when I get to come back. Of course, it will be an even smaller percentage of our lives then; we'll both be older. Is anyone following this logic? Oh, and this morning, I'm told, when he woke up, he called, "Nannie!" And when mommy peeked in instead of me, he squealed, "Mommy, you're here!" Day 25 of 31 in Slice of Life! It's my last day here. I'm going to need them! I can probably do without. Wednesday morning the train is taking me back home. I'll be back in April to see him again and welcome the second little grandchild into the world. Day 24 of 31 in the TWT SOLC! And if you don't know what that means, click on the link! Oh, my what a time we had with a little pull back car tonight after tower building time. 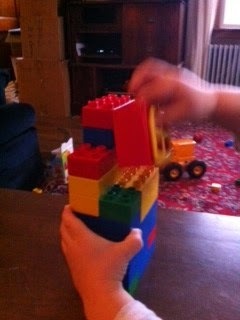 First we built a Duplo tower, then we built a tractor trailer to drive around the tower. 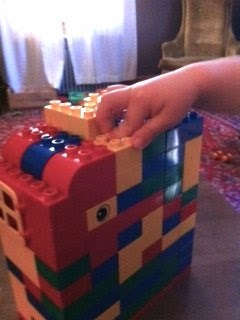 I got to drive the Duplo tractor trailer, and he had a little blue car I'd bought him and brought out with me. Then he picked up this tiny pull-back car, and we gave it a ride in the my tractor trailer. After a bit, he took the pull-back car back out of my truck. 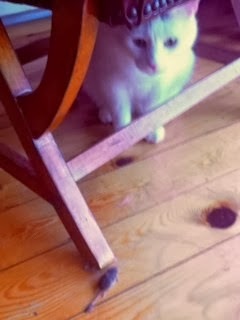 He pulled it back, and it came racing toward me on the coffee table, and right onto the floor by my feet. I looked very startled, which sent him into hysterical giggling! He dove between the coffee table and the couch and retrieved the car and did it again. This time I caught it just as it went over the edge. Again hysterical giggles ensued. This was repeated a number of times accompanied each time by the most delighted and delightful squeals (from him, not me) of uncontrollable laughter. "Ok, you catch it now," I told him. He put two hands on the edge of the table, but didn't move them when the car missed where his hands were. The car went over the edge. It was still just as funny. We went back and forth taking turns. Sometimes pulling back the car wasn't enough to get it to go the length of the table, I looked surprised or disappointed. Still funny. But then a strange thing began to happen. When the car came his way, and it went onto the floor, he screamed instead of laughed. He was getting angry. I think it dawned on him that he wasn't catching it, and now he really wanted to. I changed the game then. I gave him a container to hold at the edge of the table. The car zoomed and plopped right in. He had caught it! "Yea! Woo-hoo!" he yelled gleefully. Today is day 23 of SOLC over at Two Writing Teachers! We are close, oh, so close to April! It was a gorgeous day yesterday and we went outside twice to play in the driveway area. The lawn area is too muddy and has lots of branches and leaves that need cleaning up. The day we went to WalMart, I bought sidewalk chalk. And today we went outside and drew with chalk again. I had made a line on the driveway to show him how far away from the road he needed to be, and some lines around cars in the driveway so he'd know I didn't want him to touch them. 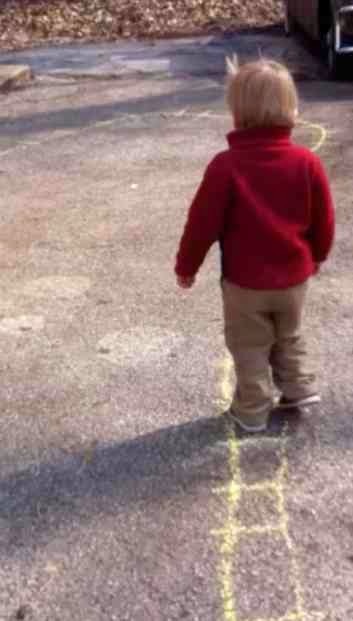 The lines became roads to him and he was trotting around on them. That gave me an idea to draw a line with cross lines on it to be a railroad track...in some places I started to draw the second rail, too, but my back was not enjoying drawing down past my ankles, and the chalk was getting pretty short, so I stopped before all of it was done. He didn't mind that it wasn't complete, nor that my back hurt. It all still looked like a train track to him, and I needed to get over the backache and get playing. There's not much that could be cuter than a tiny human Thomas Train chugging on the tracks and giving loud tooooot, tooooots! I was going to say "I wish I had a picture, but I forgot and only got some videos". But then I realized I could take a screen shot in the stopped video. I had a shower...ha-ha-ha-ha-ha-ha (said in a "You can't catch me - nah nah nah nah goo goo" way, or however you put it in your neck of the woods)! I plotted. I didn't want to risk waking him, even though it didn't wake him last week when I took a shower during his nap. I've been here 9 days and that was my second shower. It's a good thing I'm mostly alone here with a two year old! Anyway, this morning I woke before he did and waited to hear him start stirring. When I could hear him up and about (he'll play in his room sometimes for an hour before calling to get dressed and go downstairs to eat) I went to his door and told him I was going to take a shower and then we'd go downstairs. That was fine with him! He played, and I got to get clean! After I finished my shower, we had a lovely breakfast of a banana, an orange, some orange juice, and a peanut butter bagel. We tidied up, took the dog out and then headed off for WalMart in a nearby town. I got the route in Maps on the phone before we left, so I was really ready. I had plotted this out, too, for timing and ease of getting there. We did not get lost on the way to WalMart! Yea! We shopped for some household things - got some coloring books and sidewalk chalk. And then we shopped for food. Grandson was a great help. "Tell me when you see the bagels!" Zoom! 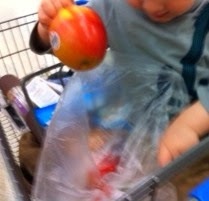 His hand would go out to point to the bagels as we slowly went through the bread aisle. "Now where ARE those blueberries? They must be around here somewhere!" He goes on point again as we swing by the frozen berries. "Hmmm. Apples, apples. Where could they be?" We put our items on the conveyor belt. I gave him some to throw on, but I did the breakables and bruisables. I hid the coloring books and told the lady at the register I'd like to avoid having him see them. She discretely rang them up, double bagged them and tied the bag closed... she told me she is Grandma to 8. She knows what she is doing! Now, going home I was pretty sure I could find my way back. Grandson had refused to use the toilet at WalMart. But what 2 year old would? It is big, echoy, and the toilets flush automatically and very loudly. So we "raced" home. The "race" became a little slower as I got "kind of" lost. I merely took one turn to the right that should have been to the left, and it took a while for me to figure it out. I stopped at a closed restaurant next to a cornfield and checked my map. "Snack?" came the plaintive voice in the back. At least I was stopped. At least I'd just been to the grocery store. At least I'd actually bought some crackers there! I got out and went back to the trunk and dug out the crackers. It was lunch time. I was hungry, too. I gave myself some snack, too. Then I exited the restaurant parking lot in the way I'd come. I found the road the house is on and promptly drove past it for a long ways. That's what I did the first time I tried to get there on my own, too. The house is hidden by tall cedar trees. At least this time I had only driven past it once. The last time I'd passed it 4 times. As soon as I recognized the drive, and just as I was going to pull in, I heard, "Go potty?" "We're home!" I answered. We'll go right in, and you can go potty." And then there was afternoon. It's Poetry Friday hosted by Julia Larios at The Drift Record! Have you been to Ed DeCaria's Think Kid, Think? You MUST stop in and read. It IS Poetry Friday, doncha know! There are some unbelievably wonderful poems out there! I happen to have a poem in this first round of the tournament using the word "miscreant". You know, I don't believe I've ever used that word before this past Tuesday. I had to look it up to find out what it meant. Because it is Poetry Friday, AND I am babysitting a toddler, AND Ed wanted extra poems for the word "perpetual" yesterday - I wrote the following poem quickly, and am posting it here as well as on Think Kid, Think. full speed with jumps and hops! with a happy, rappy, tap! When will he take a nap? Which one will be the horse today? A number of times now, Grandson has wanted to run and let off steam. He enjoys getting their small dog excited and running after him. And then, just as when we had our two kids and they would tease each other, it becomes too much excitement to handle. Some one gets hurt, scared or angry. And that happens with the dog, also. Running around with a little dog chasing you, jumping up and down when you stop, licking your face and hands and any bare tummy can get a kid pretty wound up. So there is a need for a controlled "run" - a controlled "fun" - as much for my own sanity, as his. Have you ever watched Monty Python's Holy Grail? If you have you have seen the knights pretending to ride horses and clapping coconut half shells together to make the hoof sounds. 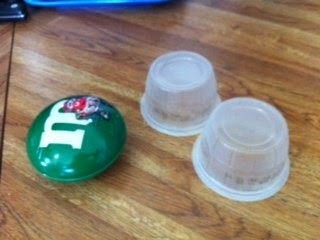 Grandson has an empty metal M&M container that comes apart in halves, that he likes to "trot" to when the two parts are clapped together. It's a great way to get a bit of movement in, but not have it "out of control"! We have spent quite a few afternoons with him trotting around the livingroom like a horse. As he speeds up, I clap them together fast and erratically, when he trots, I clap them together with a trotting cadence. When he realized what I was doing, he delighted in changing the pace of his "horse", and even slowed down to a slow walk, giggling as we connected with motion and sound. Sometimes he puts the two metal halves together, and I have a terrible time getting them apart again. So I have another plan. Yesterday he ate two individual servings of applesauce in plastic containers. I clapped them together, and they sound pretty good. I think I'll try those today and see how he like his new horse. We can always go back to his M&M horse if he doesn't like his new steed, Applesauce. It is the 20th day of 31 in the Slice of Life Challenge at Two Writing Teachers where people are linking their stories about their daily life. There are so many great stories out there, so many wonderful people! Go visit! And while you are at it this afternoon and tomorrow, please visit TKT and vote on some great poems! I just happen to have one there...and I'll never know how you voted - so just enjoy and vote your heart! If you go in the morning you can read Linda Baie's first round poem there, too! 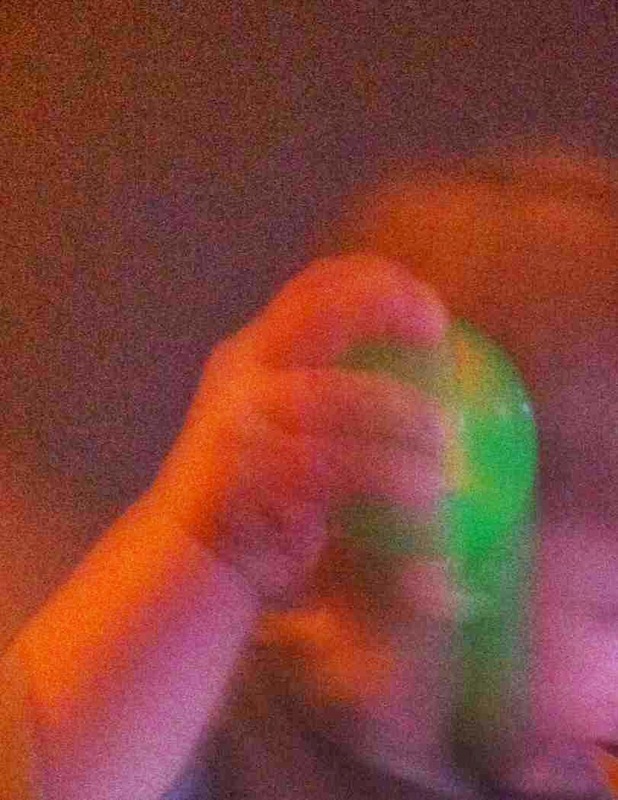 My snippet is the continuing adventures of babysitting for my grandson! Let's hope they are never real adventures, just nice calm, happy days and nights for two weeks! Before supper, Grandson wanted to see pictures I had taken of him. He knows I have pictures on my iPhone and on the iPad. 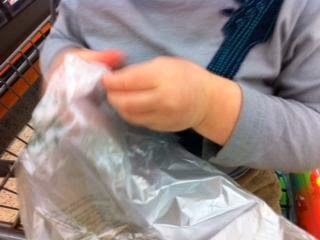 I know that he can more comfortably (or I can more comfortably allow him to) handle the iPad, so that's what we used. I set up the iPad in front of him. He sat down and basically took over flipping through pictures and playing short video clips I'd taken of him when he was learning to walk. In the background he could see his mom and BeeTee (grampie) and hear my voice as he played the videos. He was able to flip through the pictures quickly, skipping any that didn't interest him, pausing for the ones that had the telltale arrow, meaning it was a video. I watched him try to start a video with his finger but his hand was resting on the screen, too, so it wouldn't start. I took his hand and tried to help him keep the rest of the knuckles off the screen so it would play. Pretty soon, when he came to a video he would use his left hand to hold his right hand, index finger extended to help him aim at the arrow! So cute! The iPad is so easy for him to use. He saw a drawing program and seemed to recognize it as he said, "Draw" and opened the program. He seemed to have no problem with using it... except for when his finger jabbed at adding features that would cost me money! A few nights ago, while I was cooking supper, he was watching a cute animation with what appeared to be Russian dialogue. He didn't mind. The cartoons were short, and at the end he had seen how I just clicked on another video picture on the side of the screen. It was so easy. When my back was turned to the sink for a moment, I heard another video starting. He hadn't needed to ask me to play another one. He just took over at the helm. This is too natural. It shouldn't be natural. Why is it? I was just there and I like owls and my grandson is napping... so here it is. Day 19 of 31 days of Slicing! Go check in on other lives at the Two Writing Teachers where people are writing snippets of their days! What a wonderful community of writers. If you are here and I have not commented on your site, I truly apologize. I have just barely enough time to write, post and remember to link! But in the evenings I am trying to get to at least three bloggers to make comments. I have been writing about my time spent with my grandson this past week. I have one more week with him and am treasuring every moment. 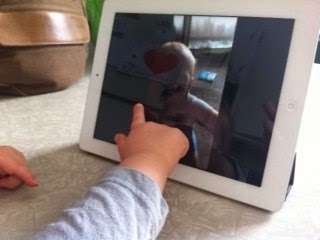 Though it makes it difficult to spend time writing, there are more important things to be done - things with deeper meaning and more far-reaching effects - things with my grandson. Last night, Grandson was needing something to make his day complete. He had watched a manipulated version of Curious George, the movie. Manipulated means, I, Nannie, had manipulated it so we wouldn't have to start early and watch too much video for a two year old, and so that we wouldn't have to have a meltdown when we got only part way through it and had to stop for bed. I merely looked for the number of minutes I wanted remaining until the end of the movie (about 30) and played the video from there to the end. Unfortunately for me, I'd slightly over-manipulated, I guess, and that didn't feel like quite enough movie to him. He really wanted more. But that wasn't going to happen. Ah-ha. Idea. Very good idea. "Let's call BeeTee and he can watch you get ready for bed." BeeTee (Grampie - my husband) is 450 miles away, in Maine. But nowadays that just isn't a problem. I grabbed the iPad and started connecting as we went up the stairs to brush our teeth. He could hear the ring to connect, and when BeeTee's face appeared, Grandson grinned. I propped the iPad up safely away from the running water and focused on that sweet toothy grin. We brushed and brushed, and all the while BeeTee could watch and talk to him. BeeTee was there for pajama time and heard the bedtime story, and prayers, too. "Who do you want to pray for tonight?" "Nannie, BeeTee...." (and, of course, his other set of grandparents and his aunts and uncles, too). BeeTee got to say good night. He was 450 miles away, but he was face to face for bedtime last night. Grandson sure loves his BeeTee, and already he knows his BeeTee loves him! First info on March Madness 2014 Tournament. Second (below the picture) the real slice if you don't care about the tournament but you do really care about my babysitting antics. Here it is, the 18th day of March, the 18th post of the month of posts for SOLC hosted by Two Writing Teachers! And not only that, but March Madness 2014 at Ed DeCaria's Think Kid, Think began yesterday with the first round of poets (or "authletes") getting their words to use in a poem. Today is the day the second round of poets (including me) get their word! In 36 hours the poems must be written and submitted. Link to March Madness 2014 Bracket for Round 1. Link to March Madness 2014 Event Calendar. I know a Slice isn't supposed to be informational really, and this isn't...really. The above service announcement is more like a " oh, my, what have I gotten myself into" moment/slice of my life. I'm still watching my grandson, so I hope I can fit some time in for writing a poem and voting on poems! He doesn't do well with " let Nannie think". Pretzel and apple snack time yesterday was fun. He is such a good eater. He loves Bob's Red Mill Oatmeal or Five Grain Cereal (of course I put just a touch of real maple syrup and some blueberries on it), bagels with natural peanut butter, tomatoes (he ate a whole huge tomato - less one slice I had), sweet potatoes, bananas, oranges, yogurt, natural and homemade applesauce, orange juice with pulp, milk, water, blueberries, salmon, tacos, hamburgers, string cheese, sharp cheddar, broccoli, corn, cucumbers...I could go on. I've not seen much that he's turned his nose up at. He's fun to cook for! While he was eating applesauce yesterday, I listened to him appreciating his food. With each bite, he looked in his bowl, and said "Mmmm! Applesauce! Yum, yum!" with each bite. Sometimes he would say "Applesauce! Yum..." then stop himself quickly to correct himself. "Mmmm!... Applesauce!... Yum, yum!" Can't forget the "Mmmm!" 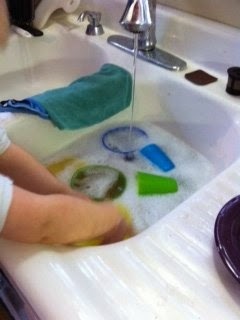 Lest you think he is growing up OCD, he did stop saying it after a while. 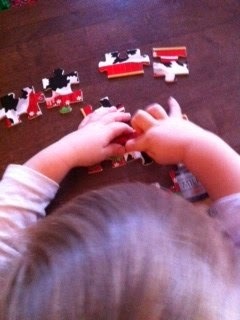 I think most 2 year olds are a bit OCD anyway! Pretzel time turned into creating time as he bit into one and made a cross shape. "Airplane!" And he zoomed it over the table. I tried to take a picture of it, but it was too small and he kept putting it up by the Apple on the iPhone instead of letting me center it on the camera. Then he found a spider in the next pretzel. "A spider! A spider!" he said as he walked it across the tabletop. 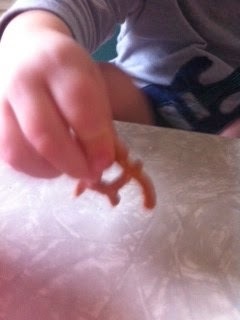 After that he took a whole pretzel and rocked it on it's bottom on the table and said "Croo!" This was repeated over and over and I have no idea what he was saying in our language. I thought maybe it had something to do with "Clue" as in Blue's Clue and the paw print. That didn't seem to satisfy him though. So I'm still at a loss as to what "croo" means in toddlerese. Fortunately, he happily gave up trying to make me understand and just ate it. On Sunday, we went to the early, 9 am church service. He knows where he is going. I have to sign him in first, but his little hand in mine was tugging to go forward into the nursery. I was greeted by a woman at the computer who typed us in and printed up our nametags - one for me, one for the little guy and one for his backpack. He was ready for full steam play. He looked pretty sharp in his plaid buttoned shirt and tan corduroys. His hair was even tidy today. His hair is fine and blond, just like his mom's was at that age. Oh, what a time of it we'd have trying to get it brushed. Because it was so fine, it would mat in the back as she slept, which is exactly what happens to him. The good thing is that his hair is shorter - so it is easier to comb or brush. The bad thing is that his hair is shorter - so when he sleeps he wakes to hair sticking up at odd angles, and with lots of static. Today, knowing I wanted to not look like a grandma that doesn't know what she's doing, I needed to get his hair looking good. I knew from days before that merely brushing it wouldn't do anything, and he would run out of patience for it very quickly. I also knew he liked orange juice. So at breakfast while he was drinking his juice, I wet a paper towel down with lukewarm water (so he wouldn't notice so much) and wrung it out just enough so that it didn't drip on him. Then I simply patted his hair down from top to bottom, getting his hair slightly wet. He never even noticed what I was doing. Then armed with more "knowings", I started brushing my own hair. To a toddler learning to do everything the "big kids" do, a hairbrush is as enticing as a stick. When I was finished I asked him if he would like to use it. And of course he did. Admittedly, I did have to stop him just as he was reaching for the dog to brush her hair, but the job was done. Tamed hair on a two year old boy. Score! At the end of church, I came up to the half-door of the nursery and was greeted by "Nannie!" when he saw me. He raced to the door and had to be reminded that he needed to get his coat and backpack. His hair still looked great! No one noticed but me. But I'll bet they would have noticed if we hadn't gotten it tamed. After church there was dinner, a bit of play, and a nap. His golden locks will again get a workout as he goes romping through his dreams! Oh, well, for a couple of hours they were tamed, and I looked like I was in full control! I'm writing this on Saturday. I won't have time on Sunday. That isn't a day I write, though I will link to the post on Two Writing Teachers for the Slice of Life Challenge for Day 16! Now we ARE officially half way through the month. Wow! He looks like a young boy, not a toddler! Yesterday, my grandson and I went outside. It was a beautiful day - about 65 degrees out. With light jackets on, we wandered the backyard. There are some old cars out there from a previous owner. 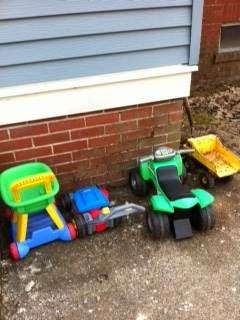 They will get towed away soon, but right now they are a fascinating play area for a 2½ year old boy. His body just naturally turned to direct his feet that way. "Come over here and see all these sticks," I enticed him. Sticks are the next best thing to cars when you are a young boy. His head turned and his feet followed. "Let's make a pile of sticks," I told him. And so for about a half an hour we happily gathered up sticks. 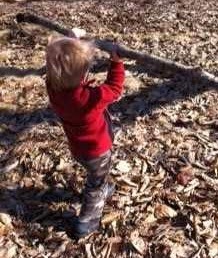 He especially enjoyed getting the big, big sticks. Then in the middle of it all, I heard, "Uh-oh. Potty. Help." And he was headed towards the house. We got in there in time, and he was delighted with himself. I was impressed - he knew he had to go; he was doing something fun and stopped; he had a ways to go to get to the house; then more to do when he got there - up the steps, in the door, to the bathroom, get the stool in place to step up, get the potty seat on the toilet seat and finally go potty. Phew. I had been tempted to just picked him up and carry him to get to the house more quickly, but decided against it. Didn't want that to be a habit he acquired while I was on duty! We went back outside then, to pick up some more sticks. He paused when he saw the rail fence at the edge of the lawn. He went over to it. I was watching and warned him not to go on the other side. But he didn't. He stopped at the fence and called over it, "Cows! Come here cows! Where are the cows?" "There are no cows at this house," I told him. Their old house was on a farm with fences and cows. This is their new house. Some Canada Geese flew overhead just then, honking all the way. "There go the geese!" I said, pointing. "Bye, ducks!" 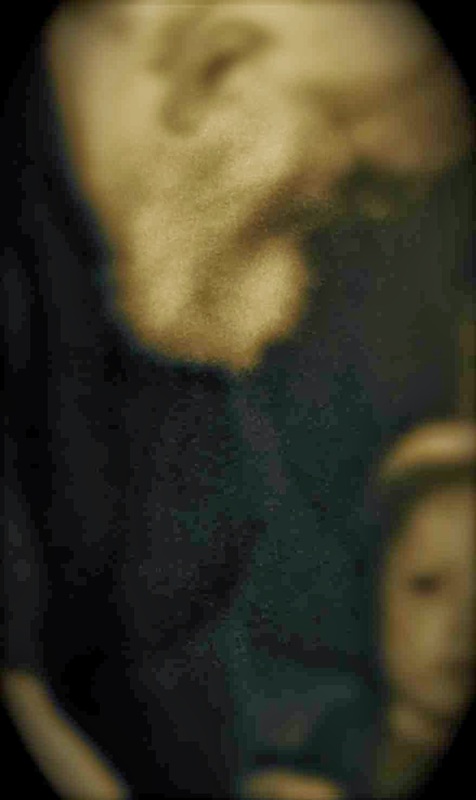 he called to them, waving. "Those are geese," I told him. "Honk! Honk!" I imitated the geese as best I could. We returned to piling sticks for a little while longer. Then we went inside for lunch and a bath before nap. Picking up sticks can make you hungry, get you dirty and wear you out! Perhaps today will be the day he remembers the word "geese". He hasn't walked on the sofa again...yet. It's day 15 of 31 slices! Yippee, Skippy! It's the half way point, kind of! Head on over to Two Writing Teacher to read more slices today! I like being called Nannie. My mom was Nannie to my kids, and my father's mother was Nannie to me. There is something so sweet hearing it for the first times, knowing your grandchild recognizes you and has a name for you. "Don't stand on the couch. Remember what Mommy said." He continued to walk on the couch. I said his name sternly, then, "Do not walk on the couch!" "Yes, Nannie," came the reply as he plopped down on the couch. All was really going pretty smoothly - just the usual reminders of not to touch, and directions in the morning. Shortly after lunch it was nap time and I took some time to write my blog post. There was about an hour left to relax and pick up a few toys before nap time was over. At 4:00, he woke up, ready for snack and more playtime. He always wakes up so happy and full of life, raring to go! So, it was no surprise that after his snack he took off out the doorway and around the corner to the living room where he had a stash of toys and books. I cleaned up his snack spot and was about to follow him, when I heard his frantic call, "Nannie, Nannie, Nannie!" "What? What's the matter?" I called as I speed-walked to the living room. It didn't sound like an injury call, but still a strange tone. He kept on calling me, "Nannie, Nannie, Nannie!" As I came into the living room, there he was sitting on the couch. What could be the matter? He hadn't fallen. He was just sitting there in a blanket in the middle of the couch. But then I noticed. He wasn't really sitting. One leg had gone down between the two pieces of the sectional couch. He was stuck. He had obviously been walking on the couch again, and had suddenly been trapped as his foot slipped between the cushions. I tried just pulling him up, but he truly was stuck. I pulled one section away and freed his leg, and we had a short reminder of the "no walking on the couch" rule. "Yes, Nannie," he answered his eyes looking into mine. We'll see how many times Nannie has to remind him tomorrow. I'm babysitting for my grandson over the next two weeks. Yea! (I think.) So far it is "Yea". As long as I can go to bed on time and take some rests while he is napping, then I should be fine. It's a busy day with a 2½ year old - especially when it's been about 30 years since my last one was 2½! I think I'll have plenty to slice about for a while! And below is my contribution to Poetry Friday hosted by Kara at Rogue Anthropologist. Can't believe I got it done! Now to link before he wakes up. 12:37 - It’s naptime, and I already have plenty to write about. I am having trouble picking one thing to write about though, so I guess I'll just start writing everything I can remember about this morning and see where it takes me. Wow. As I compose this list, I am starting to get an appreciation for how much I should be able to get done in a day. Can I make a poem out of this for Poetry Friday? Maybe. I’m going to try. while he’s sleeping. After that...no more writing until bedtime at 7:30! That was more than I thought I'd get done. I'm getting to be more like him already. Hope I don't get worn out in these two weeks! It's hard to get out there and comment, but I'll try in the evenings to do that after he's gone to bed. My slice today is at nap time. Posting is going to be tricky for a bit. Trying to find the right time and place will be interesting. It will be especially difficult to do March Madness 2014 Tournament that's starting soon. Today, Laura Purdie Salas has her 15 Words or Less challenge. I decided maybe I'd have time to do that, but that's about it for today. Go there to see her picture prompt. It is an American Girl doll in a carrier that has a cutout heart for her face to either be seen or so that she can see...maybe both. Here's what I came up with for the time being. I will try to make the rounds to comment later today. Yesterday was too wild. It's going to be wild for a while. I need time and a place. Sorry for the gory story. This is Slice 12 of 31 of the SOLC at Two Writing Teachers, and the poem below it, goes with it, and it's a contribution to Poetry Jam where the poetic topic this week is FOOD! About once a month a friend and I meet for tea and a cookie. Two weeks ago when we arrived for tea, my usual giant homemade gingersnap cookie had just sold out. I asked her to run after the person that had bought the last one and get it back, but she wouldn't do it. She did, however, agree that the next time I could call ahead and have one put on reserve for me. I think I will have to do that! 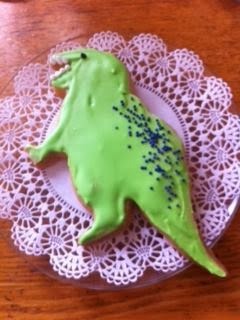 I substituted a homemade shortbread Tyrannosaurus Rex cut out cookie for my usual. It was cute, and very sweet! But I think, really I may just try calling to make a gingerbread cookie reservation next time. Would you like Mr. T? The whitest teeth you’ve seen. 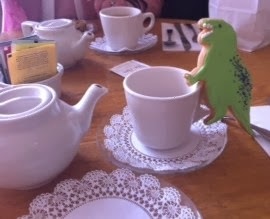 He has his bite with tea!" Two weeks ago, my daughter drove up for a mini reunion with some high school friends. I knew I would soon be going to her house to take care of my grandson for a couple weeks, so I very cleverly packed my suitcase for her to take back with her. That way I wouldn’t have to travel with it on the train. First off, my shoulder won’t allow me to put anything in the overhead on the train, and secondly, the commuter train that I have to take locally out of Philadelphia really doesn’t have room for luggage. They are just planning on having you go to and from work ... commuter style, of course. For two weeks now, I’ve been uncleverly wondering to myself where in the world all my clothes went? I've emptied drawers. I've double and triple checked the laundry to see if I’ve left a dryer or a washer load in a machine. I've sorted and resorted dirty clothes seeking a necessary item. It eventually dawned on me what I'd done. Everything was now in Pennsylvania waiting for me to get there. No wonder I was experiencing a clothing shortage. I'm okay now. I just have to do laundry more frequently and with smaller loads - and remind myself of why this is happening, so I’ll stop looking for things. If I can’t find something, it must be in Pennsylvania. When I return, I am not bringing the suitcase back, for the same reasons I sent it on ahead, and I’ll need clothes there again the following month anyway. We’ll drive down there when grand baby two is born, and I’ll already have clothes there for that visit. For that trip home, all my clothing will ride home with us in the car. I'm sure there will be tears of joy when my Pennsylvania "travelers" are reunited with the Maine "stay at homes". Reunions are great things. I'm thinking I may have to steal a few articles of underwear this trip, though, and tuck them into my purse. They may get an earlier reunion, I need more than I left for myself. 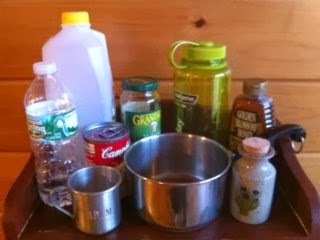 Day 10/31 in the Slice of Life Challenge at Two Writing Teachers. Enjoy the reads! Saturday morning, our new cat (not sure when he will become just plain old "our cat"), Noah decided he wanted to play as soon as we woke up. He doesn't usually get right into play mode first thing in the morning. There are pats to be done, leg to be rubbed, meows and words to be exchanged and bowls to be filled, etc. But this morning, as soon as I opened the bedroom door, he marched straight into the room and headed around the door to the corner where I keep his toy bird-mouse on a springy coily plastic thingy on a pole. I'm sure there is a shorter name - like cat toy - but then you wouldn't know why it is so much fun for him. Anyway he went right over to it and wanted it "in play" now! So even before getting dressed I got the toy out and started letting him run around after it. He was in a good leaping mood. So I bounced it up in the air, and he leaped and and caught it in his claws, landing with it in his mouth, or shoving it in his mouth soon after landing. He rolled around on the floor with it and let go of it so I'd know to do it again quickly. When my husband came out, I handed him the stick and said I wanted to get dressed and start the coffee. So he took over for a bit. I could hear Noah's heavy thuds as he leaped and landed. My husband was telling me what a great jumper Noah was, when suddenly his voice changed tone, a bit more excited, intense, with a tinge of amusement, as he called me to the living room. "Okay." I'm thinking, "What is there to look at? They aren't playing any more." When I got into the room, he was pointing at the floor with the cat toy pole. I looked down. There were brown clumps of cardboard that the cat had clawed and bitten off his catnip "recliner". Okay. I know. I have to vacuum them. I'll get to that later today. He has made quite a mess. But that is normal. Cat hair and corrugated cardboard, I can see that. That's not a chunk of brown cardboard. I looked more closely. It had little feet. It had a tail. It had a long snout, and I couldn't see it's eyes. It was a baby (it was quite small anyway) mole! Dead. My husband picked it up with a paper towel and we looked at it close-up. Unlike a mouse, its eyes were just tiny low dots. Its snout was definitely too long for a mouse. The body was still limp, not stiffened yet. It had evidently recently been a cat toy. There were no teeth marks, so I'm assuming Noah just played with it to death. And upon the early demise of the mole, Noah was still in play mode. I assume that is why he was so insistent on getting his toy out. Who strayed way too far from his hole. I'm sure he was a very fine young mole who died well before his time. But you just can't come strolling into our house any more. Our cat doesn't just watch little critters and ask if he can keep it, like our old cat did. Ha! Why there we go... I guess the transition to "our cat" just took place! Day 9 of the March Slice of Life Challenge! Check out other Slicers' offerings at Two Writing Teachers. 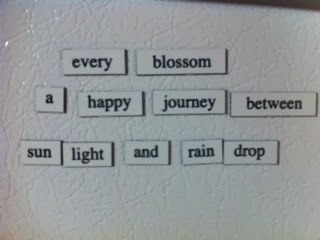 More refrigerator poetry. 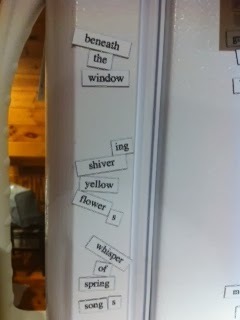 I posted the second poem I created on the edge of the door of our refrigerator. I don't know why. I guess it was because I could see all the words from which to choose more easily, as they are on the side of the refrigerator. 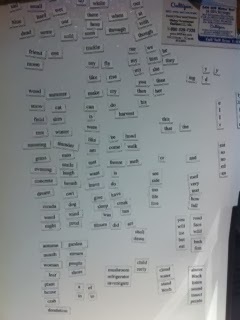 I still have the first poem up on the front of the freezer door, and I just didn't move this one to the front yet. No reason. Maybe I'll go move it. Or not. I kind of like how it travels down the narrow edge of the freezer door. We have just got to get rid of this snow. My spring poems are starting to blossom. They'll die in this cold! But to warm us all up - I've put my second haiku in Haiku Deck as I did yesterday. Day 8 of the March Slice of Life Challenge! Check out other Slicers' offerings at Two Writing Teachers. No matter how many words you get in these sets, you always want more. They must have sugar in them. Like candy, words are addictive - you can never get enough. A haiku requires willpower then. You cannot indulge in wanton wordiness. Ok, though you shouldn't indulge in wanton wordiness with a Haiku, you can however play with its format as much as you like! So I'm trying Haiku Deck here with the same words. Fun! It's day 7! Yea! 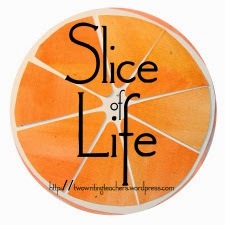 A whole week of posts in March for Slice of Life by Two Writing Teachers AND it's Poetry Friday over at Reflections on the Teche with Margaret Simon Stop by and enjoy some great posts in both places today! It seemed that yesterday was a rooster day! As I was bopping through the Slices for Thursday, someone had posted about their mean rooster that would attack them as a child. Someone else had mentioned a rooster that would come running after their mother when she was out hanging clothes on the line. We had a renegade rooster, too, who would come tearing after us. Now he didn’t always do it, but when I think about it, it was probably when we had the dog in the yard with us, that he would let us pass. I remember one day hearing my brother, who was probably 8 at the time, yelling wildly from the porch for my mother. She came running from somewhere in the house. My brother was kind of accident prone, or catastrophe prone, so when she heard him yell or scream, she knew she had to move fast! So she did. And there he was on the porch holding with outstretched arm our rooster! He had him around the neck, and was yelling for help! The rooster had been chasing our little sister, following her right up onto the porch. He had rescued her from her attacker, but had no clue how to now get out of this predicament. He couldn’t just let go or he’d be the victim now! Mom rescued him from the clutches of that rooster (though to the rooster behavior novices it would look as if the rooster was in his clutches!). Then, just when I’d thought “hey, that would be a good story to tell sometime” - which I just did - I remembered it was Laurie Purdie Salas’ 15 Words or Less Thursday (go here to see the picture). I went to her page and saw a picture of a giant rooster outside by a snowbank. It looked as if the picture had been taken from inside a building. It looked about as imposing as our rooster did to me when I was a kid. It looked like it was waiting outside for us. It was our nightmare rooster from a long ago childhood. It also reminded me of one other thing. Maybe you’ve seen it, too. On TV. Saturday Night Live. Remember the shark knocking on the door? Yesterday I had a wonderful visit with my daughter and 2 ½ year old grandson via Google chat. It was fun to be able to watch him have lunch and play with his little truck. It was fun to hear him say "Hi, Nannie!" and see him smile. I even held the computer so that he could see our new cat play with a cat toy and hear the cat meow...and then hear him meow back! The part in red, I added this morning, per Andrew's thought that it needed something at the end. I totally agree! It was bugging me, but I decided to post it feeling unfinished. I was up by 4:30 this morning to look at it again, having auto published at midnight. Oh, and changed "magnum" to "shaker". Magnum kept putting me in mind of Tom Selleck. So he's gone! Now I can go back to bed for a bit! Aaah! And now it is Day 5 of the March SOL. Because on Sunday the names of the Poetry Authletes were at last made public, I can finally tell you that I am in at least the first round of the competition. I am a bit nervous about it, because, not only will I be posting and helping here, I will be visiting my grandson some this month AND composing a poem under duress - maybe more than one if I'm lucky enough to move on to the next round. I guess I will relive, at least for a few days, what it is like again to have a day job, have a toddler and try to write! It's hard enough when I'm all by myself and just LOOKING at work I should be doing. Whether I lose or win a little bit, it is always an honor to be in there writing with the wonderful poets included in this list. I know there are some of you Slicers who are in the March Madness 2014 poetry tournament this year, too. Are we slicing off more than we can chew? Before he wakes for breakfast, please. Individuals may vote also from their home computers. But once you have voted on the day's offering of poems, that computer is finished until the next round! No doubling up on votes! That means each spouse would have to vote on their own individual computers. The poets have a word assigned to them and they have 36 hours to craft a poem using that word. The poems are then put up for all to read and vote on for a day. Votes are tallied and a winner of each match is declared. Winners are paired, and the next words are assigned for a new face-off. So check out the page, sign up your classroom, and be ready to read some good poetry (there's never any bad poetry, is there?) later this month! You may even find one of the poems leads you to a slice! Today I received a neat comment on an old post. Someone had done a search on "Walter Reed, Woolwich", and my blog post "Walter Reed's Gulf Station", came up. 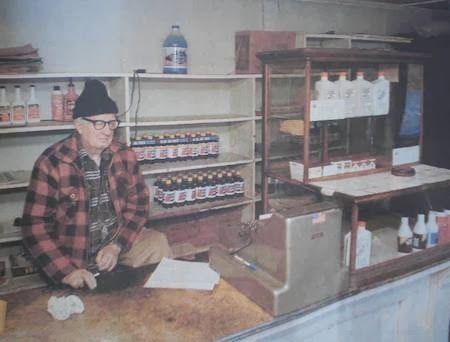 I'd had another comment on it prior to this one from someone who had lived across the road from this man and his Gulf station. I had asked the commenter if they were perhaps a daughter of Carla, who was a good friend of mine who lived down the road from me. I had heard from someone that she got married and lived in the house across from Walter and across from where I had lived as a child, just down the road from her old house. This person was not Carla's daughter, though. She gave me more information and her sister emailed me later, too, with a picture. But on Monday night, lo and behold, Carla's son, who no longer lives in Maine, commented on my post! He was the one searching for information on Walter Reed. Unfortunately, I've lost contact with Carla and her family. We spent summers playing out in the fields behind our houses and in the great big barn she had at her house. We rode imaginary horses and played school. I got stung by a bee on top of my head in the old dairy barn! It was her house I was riding my bike home from when the bats seemed to be (really were!) chasing me (The Feeling of Bats). I am so thrilled with this contact from the past! What a neat thing this blogging is! You never know where it will lead!